I don't even know what I'm suppose to say here. Last full week was fulfilling. Plus it was filled with so many good things. Emmeh Sherif was baptized on Saturday. The baptism was super spiritual, she was so prepared and I am so grateful to have met her and been a part of the last few steps she has taken to walk with Christ. She was baptized by Bishop Nelson, and given the gift of the Holy Ghost through Bro Watkins. Kate Titus, and Sis Shirley both spoke at the baptism as well. It was very unique as most of all who played a role in the program were converts. Last week was pretty much filled with appointments and preparations for the baptism. What's happening to the Level Creek ward? Well they are replacing us elders with a new set of sisters. Elder Valentine is now going to be serving in Sugar Hill, it's the same area, just different ward. He's pretty excited, this young buck has many many more good things coming his way. Today on our last preparation day, we have had a Zombie Nerf war in the church. Saying goodbyes to many members, and final calls to the rest of the southern folk. Tomorrow... last district meeting. It's been such an honor to serve and be a part of God's church on the Earth, to be able to help people. To bring them in some way closer to Christ. I made the right choice two years ago to serve, I wondered what would happen and hoped that I would find out once I got there. Well it's come, the time is now. This last letter only compiles what consists of two years of experience, memory, and adventure. That choice made all the difference, so now it's just to try to put it all into the real world.. yikes! To keep in touch continue to email me here, or hit me up in SLC! I'll be there for a while til school starts. Here's to the two years. See you fam in three days! Our last adventure today was a hike to Amicalola Falls. It was a pretty good taste of what hikes in Utah were like, Olympus, Brighton, Timpenogas if I can recall back before the mission. Kinda excited to do things like this more often. ​​For last adventures, this one was quite memorable, afterwards we went to the Dawsonville Outlets, then to the stake center for a short time nerf war. Oh the mission is great, does it have to end? There's so many things that come to my mind when I think about the mission. The first is how fast time has gone by. The second, how time has probably been about average for the rest of the world. You've probably heard me say that every week since I've left home. We had an exchange Tuesday with Elder Anderson the nostalgia was ever present as it was our trainees who were together while we reminisced the Monroe days we were greenies together. The Level Creek Ward was on fire again and we had some good lessons with some of the focus families. We've set different goals to get some of these families back to church and incredibly half way through we reached that goal. Thank the lord! Emma Sheriff and Chynna Bell were able to make it to church. It was great because Elder Parker of the Area 70 spoke. Hallelujah! Both did great. Emma is very spiritually prepared and her baptism should be this Saturday. Hooray! Chynna too still desires to be baptized soon, and as for Mary, Her baptismal date has been pushed back. Last night as well was great, a member from the stake put on a presentation called "What do Mormons Believe?" And the turn out was great, about 12 Nonmembers were there and I think all learned more of the significance and importance of the restoration. This coming week ... should be peachy. We will be busy finishing up lessons for a baptism for Emma, making calls to members, converts, and other families for the farewell fireside next Wednesday, and then the other final preparations for the next transfer. The mission is planning on transferring me and Elder Valentine out of Level Creek and whitewashing it with a new set of sisters. Out with the old in with the new it would seem. So lots of finals and lots of lasts this week!!! That's it for now, until next time, wishing you the best week and best of fortunes! So far it's been a pretty good 21st birthday! Elder Valentine gave the gift of Sonny's Southern BBQ, mmm so good! Also opened a letter from the mission, the "itinerary"... yikes! One of the best Sundays of the mission! So if you remember Shristi, she was able to make it again for church. Later in the evening, we had a lesson with her and are currently teaching her English through the Book of Mormon, she gave us some really good Indian food afterward. And if you remember Mary, she also made it to church again and she's doing great, learning and living the gospel and still on date for the 27th. And then a new investigator, and THE MOST solid investigator I've ever met, Emma Sheriff came for the first time and she wants to be baptized ASAP. Emma's from Liberia, she was a referral and when we met her last week she immediately wanted to be baptized. Her background is very unique, here's a quick article I'd invite ya to read cause it's gives a brief look of her background story and what she's been through. From Muslim to Christian to LDS, she's come a long way and it's a blessing to see how God's hands have worked in her life. The whole week was pretty awesome, we were able to have a great Zone Meeting. Sadly it was the last zone meeting of the mission, and gladly i thought one of the best. Again these meetings, a lot like church don't really mean a lot unless others experiences are being shared and the power of the spirit is brought in. The testimonies were stellar, and the trainings, oh so powerful. Being able to have the opportunity to be a missionary to missionaries is and has been one of the greatest blessings of the mission. We had a pretty good exchange on Friday, I was with the old buddy and companion Elder Sorensen back in FLOWERY BRANCH. It was good time, we were able to have some good lessons and recaps of our adventures together. It ended with a Pie Tie party at the Decooks, saying goodbye to their son Ryan who heads for his mission in Racife Brazil this wednesday. A story begins and a story comes close to an end! We'll be doing an exchange with Elder Anderson, I've felt really bad cause I've been the one leaving the area and leaving Elder Valentine in Level Creek for the past three exchanges. Tomorrow though he'll get his way out of here. And for the rest of the week, and transfer we'll just be focused on training. as from us, as that the day of Christ is at hand." That's about it for now, enjoy your day and god bless! So for those who are wondering how much longer you've got, yes there are only 3 weeks left til this trip gets cut. I cannot believe that two years have come and gone, I'll be 21 in just a couple days, and everything just feels so weird. This past week was booked beyond compare. For all the weeks I've served, seriously I've never had so much going on. We had two separate interview/district training sessions on Tuesday and Thursday, Elder Hamrick (Other Zone Leader) and myself had to be in attendance to, Mission Leadership Conference on Friday, and then baptismal interviews for several individuals and families coming up this weekend. Baptisms are happening in the Dahlonega Ward. It's all been really exciting and good work that's happening, but with all the moving and hustling and bustling there seems to be so little time for my little baby ("grandson") elder valentine! I felt uber bad that we didn't get too much time to train and actually work together this past week, but this kid is still fantastic. 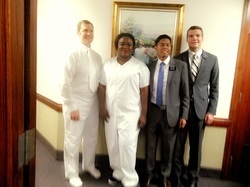 I'm very proud of him because on Friday while Elder Hamrick and I were at MLC, Elder Valentine and Elder Hull (Hamrick's companion) visited a girl we're teaching, Chynna Bell, and had a great lesson with an extended baptismal invitation for her to be baptized on October 27. She accepted and wants to work toward that day. Sunday she came to church for the second time and actually bore her testimony in front of the whole ward. Quite miraculous! Yeah, I'm very excited for her and again so proud of my boy making his first baptism commitment. Wish I could have been there! Also on Sunday an investigator, Mary Morey came to church for the first time. We met her the previous week through a referral from the Spanish sisters. She's in her 60's, lived all over the USA and has been searching for a long time for spiritual knowledge and truth. She's kinda like a genius, highly intelligent, thoughtful and considerate, lover of music and piano. After church she came to dinner with us and we invited her to be baptized as well and set a date for September 27. She really desires to understand and learn more and has already made great relationships with some of the ward members. Last night we stopped by Mary's, she gave us southern grapes that were huge! After we talked more and then shared the Restoration clip of Joseph Smith seeing God the Father with Mary. She liked it and has already been praying and reading tons of the Book of Mormon, and wants to read more of the Joseph Smith papers. Oh well! Ce La Vie! Things are still going good and the mission is still going really great, I'm learning still every day, and have definitely seen the changes in myself. I've been really inspired with the individuals around me lately too, the missionaries and the members. I'm not always grateful, but lately everything seems to be at it's last for me, so I definitely feel it a whole lot more. I love this gospel, and the Lord. He is my shepherd and friend! Thanks for all that y'all do and keep up the good lives, have a good week! Oh good, I wondered if those sent or not, the iPad said they couldn't send cause they were so big. It's good to hear that that blog is still going, I honestly don't know or think that anybody really read it or paid much attention, but I am glad that it serves as a real journal and memory book for the mission. Plus to know that my mom took the time to compile and put it all together, like a real Mormon haha;) We actually stopped by Costco today, it was the first time in two years that I'd been into one of those stores, what's up with TVs being round? Oh I was looking and found that I now only have one last pair of contacts to wear for this next month, after that I will be out. We will probably need to find some new ones and even meet with the eye doctor, my eyes dilation has shifted in two years and It's kinda noticeable with my prescription glasses on. I hope you received by now the package of items I shipped home that won't fit with me on the aeroplane. I've appreciated the letters and love from you all. So glad to share this gospel, cause it's true, cause it serves a big purpose for all of us. The pretty chill and legit parentals of Elder Black, Tiffany and Henry Black.